With rising popularity of energy drinks (supermarket shelves contain dozens of different brands), exactly how much caffeine can you safely consume? 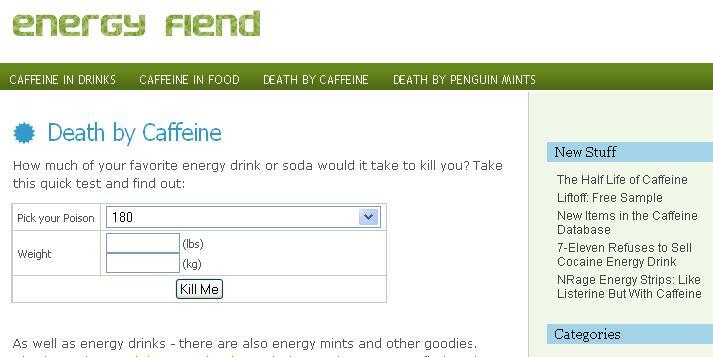 Caffeine-centric blog Energy Fiend has the answer. The same study showed that people with compromised liver function had a significantly longer half-life (a 49-year-old woman having alcoholic hepatic disease had a serum half-life of 168 hours). 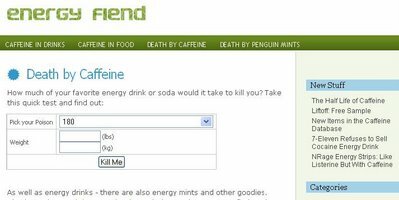 Use the death by caffeine calculator to see how many cans of Red Bull or Coke you can drink before keeling over. If you're a real caffeine addict, you can use these two pieces of information to figure out a caffeine dosing schedule to keep your body at peak caffeine levels without overdosing (Note: Not Recommended).